Castor oil is a useful and versatile oil that comes from the castor oil plant. The castor oil plant produces castor beans, which is where the oil cis taken from. Castor oil has a multitude of uses, in both the health and industrial sectors. The castor bean is composed of 40% to 60% oil, and this oil is rich in triglycerides known as ricinolein. Castor beans, however, also contain a potent toxin known as ricin, which is present in low concentrations. The castor oil plant is a species of flowering plant that can reach up to 39 feet, the size of a small tree, when growing in open spaces and warm climates. 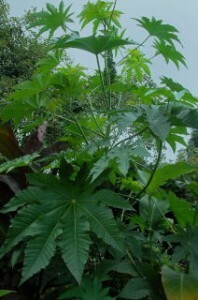 However, every castor oil plant varies greatly in its appearance and growth habits. The plant is generally fast growing, but the castor beans are cold hardy, meaning they require a long frost-free season in order to mature. This is why why the castor oil plant thrives in the southeastern Mediterranean Basin, Eastern Africa, India, and other dry and tropical regions. The castor oil plant has large leaves that are 15-45 centimeters long. They are long-stalked, and palmate with 5-12 deep toothed lobes. These leaves are glossy and often appear red or bronze-tinted when young. As the plant grows older, the leaves gradually change color to dark green. Sometimes, they assume a reddish tinge when mature. Even the stems vary in pigmentation. The flowers appear in clusters at the end of the main stem in late summer. The flowers are usually green or red in color, depending on the variety of the plant. They have no petals. Male flowers often appear yellowish-green with prominent creamy stamens. They appear in ovoid spikes up to 15 centimeters long. Female flowers appear on the tips of the spikes and can be distinguished by their prominent red stigma. Castor plant fruits appear as oblong, spiny pods, which contains an average of three seeds. Their color ranges from green to reddish purple. The seeds contained within the fruit are oval and light brown, sometimes appearing mottled or streaked with light and dark brown shades. The pod resembles a pinto bean. Greek historian Herodotus first documented the castor oil plant in 4th century B.C. and called it “Kiki.” He said that the oil from Kiki was used by the Egyptians for various purposes, such as providing fire for lamps and as an ingredient for unguents. By this point, the plant had already been introduced to Greece, where it is cultivated up to the present day under the same name. Later on, both Theophrastus and Dioscorides described the castor oil plant, and Dioscorides even gave an account of the process of extracting the oil from the plant. He emphasized that the seeds should be used externally as they were extremely purgative. There was also a mention of this plant in the Bible under the name “Kikajon”, in the Book of Jonah. During the early Middle Ages, the castor oil plant became popular in Europe for its medicinal qualities, particularly in the treatment of various skin diseases. Albertus Magnus, the bishop of Ratisbon, recorded and cultivated the plant in the middle 13th century, but the plant later fell out of favour and became less popular. In the 18th century, castor oil and seeds required for European medicine were imported from Jamaica, and the name “castor” started to be used. While the castor oil plant certainly has many benefits, it also has a deadly component: the ricin toxin, found in raw castor beans. In fact, ricin is one of the most poisonous naturally occurring substances known to mankind. It is poisonous not just to humans but also to various animal species. Ingesting four to eight castor beans is said to be lethal to adults, but reports of castor bean poisoning are relatively rare. Symptoms of ricin poisoning include abdominal pain, nausea, vomiting, diarrhea, increased heart rate and seizures. It can progress to severe dehydration, low blood pressure and decrease in urine within a few days. The symptoms can persist up to a week, although they typically start to appear within two to four hours of ingestion. Full recovery is possible when the poisoning is treated promptly. There is no need to worry about ricin poisoning from using or ingesting castor oil, since the poison is extracted from the beans when the oil is made. Commercially available castor oil is not toxic to humans in normal doses, and can safely be used internally or externally.